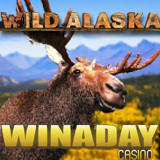 13 December 2012 (London, UK) – WinADay Casino takes players to the northern wilderness with its new Wild Alaska slots game. The new game is generous with free spins and multiplies wins 3x in its bonus rounds. A 50% deposit bonus is available today to give players some free cash for trying the new game. A tournament played on the new game begins today and ends Sunday.